In order to make a publication visible to users (in their “Publications Available” tab) so that they can choose to enable it, you must share the publication. Click the down arrow icon next to the publication title, and select Sharing. If you are not currently sharing the publication, click the “Share the Publication” text link. 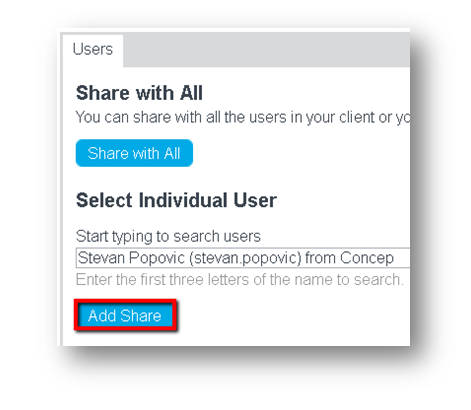 Depending upon your company’s settings, you can choose to share with all individual users at your company, with all users at specific location(s) or region(s) in your company, or with all users at your company. 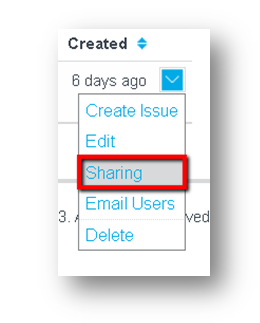 Select the user(s) or location(s)/region(s), and click the Add Share or Share with All button. After a publication has been shared with you, it will be visible in your account. You must enable a publication in order to have the content from the publication distributed to your account for sending. Click the Publications text link in the “Manage” box on the Home page. In the Publications Available tab, click the down arrow icon next to the publication you wish to enable, and selectEnable. 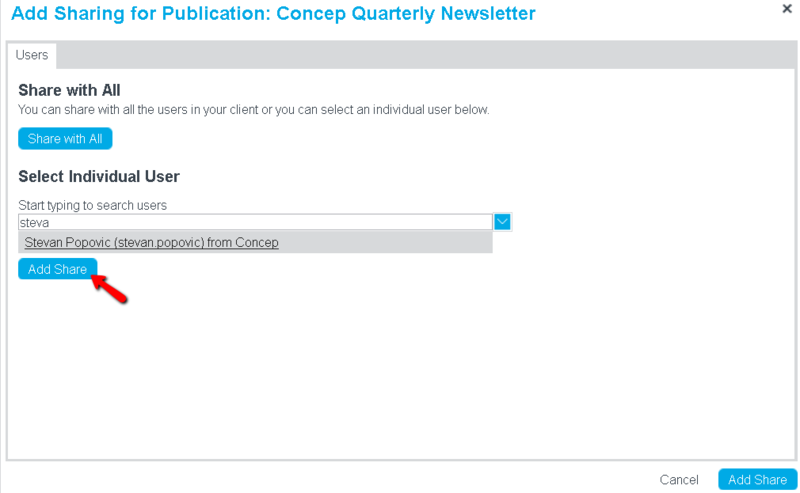 Choose if you want each new issue of the publication to be sent to all of your contacts or to certain groups. 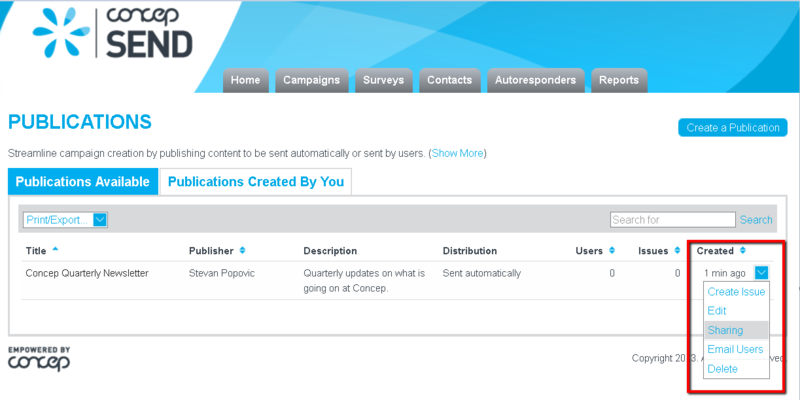 Click All Contacts to send the publication to all contacts, or click Select Groups to choose specific groups. You will be able to change the recipients later if needed. If you elect to send to select groups, you will be taken to a new window displaying the list of groups available in your account. 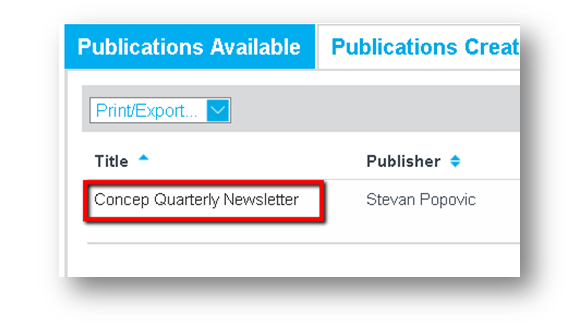 Select the group(s) you wish to receive new issues of the publication, and click the Select button. Then you will see on the Publications Available tab the Status column of the publication has changed from “Disabled” to either “Enabled, sending to all contacts” if you had selected all contacts or “Enabled, sending to groups: [list of groups]” if you had selected specific groups. Click the publication title to access its details. Click the Users tab to view a list of users that have enabled the publication as well as the groups they have chosen to receive new issues. 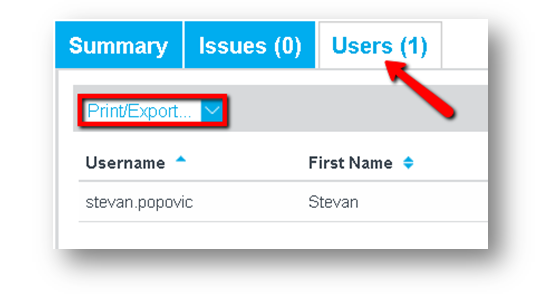 Use the Print/Export drop down menu to export the details to CSV or XLS. 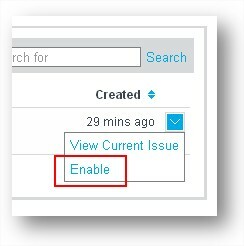 If you need to stop future issues from being sent from a user’s account, you can remove the user from the publication. 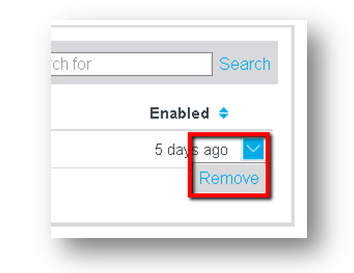 Click the down arrow icon next to the user, and select Remove. Click the Delete text link next to the share you wish to stop. Settings > Email > Publications > Distribution Options. Here you may limit the publication issue distribution options for users, which is useful if you want to attain consistency across accounts.